Bayern Munich stopped winning but that didn't spell the end of European football as we know it. Barcelona, Real Madrid and Paris St-Germain kept the flag flying for the big guns, while Fiorentina regained the lead in a topsy-turvy Serie A. But what are the stories you might have missed? Sweden have crowned unlikely champions and a few familiar faces are back in the limelight. Oh, and happy Juventus day! BBC Sport has dug beneath the surface of European football this weekend - and this is what we have found. While it's hardly been cold enough for a big coat to watch football over here, the onset of winter in Scandinavia means it's crunch time in their domestic leagues. And it's already all over in Sweden, where IFK Norrkoping have emerged as unlikely champions. 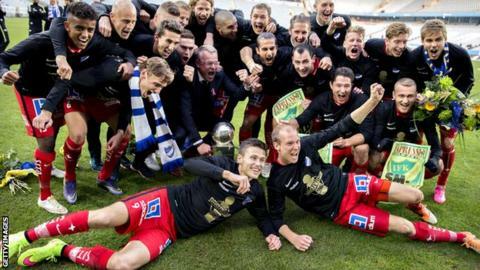 A win on the final day of the season guaranteed a first title since 1989 for the club that dominated Swedish football in the post-war period. Norrkoping held their nerve to win 2-0 at unseated champions Malmo, who had two men sent off and slipped to fifth in the table to miss out on a place in Europe for next season. Emir Kujovic and Arnor Traustason were the goalscoring heroes for a side which finished 12th last season but now have their 13th championship after holding off the challenge of IFK Gothenburg, who ended with a 2-2 draw at home to Kalmar to finish four points behind. Former Arsenal striker Nicklas Bendtner wasn't renowned as the most modest of footballers during his time at the Emirates Stadium. But he did have the good grace to admit that his goal for Wolfsburg in their 2-1 win over Bayer Leverkusen was somewhat overdue. "About time," he admitted on his Instagram account. The goal, controversially awarded following an apparent offside in the build-up, was the first Bendtner had scored in the Bundesliga since August and helped his side moved up to third place in the table. For entertainment alone, the Netherlands was the place to be this weekend with goals galore and a shock at the top of the table. Second-placed Feyenoord lost 1-0 at ADO Den Haag, who finished the game with 10 men but held on to secure only their second league win of the season thanks to a comical own-goal from Sven van Beek. That result allowed Ajax to stay three points clear at the top after their win the previous day - a 6-0 thrashing of Roda JC. Viktor Fischer, Davy Klaassen and Arkadiusz Milik each scored twice as Ajax bounced back from a cup defeat to Feyenoord before the top two meet again next weekend in the league. Defending champions PSV Eindhoven also hit six, although they let slip a three-goal lead before going on to beat bottom club De Graafschap 6-3 to stay third in the table. Former Brighton and Sunderland boss Gus Poyet is back in management and made a solid start in his first game in charge of Greek side AEK Athens. It was a potential baptism of fire for Poyet in a derby clash with city rivals Panathinaikos but a 0-0 draw away from home eased him into the job - even if it helped neither side in their unlikely pursuit of runaway leaders Olympiakos. Every year on 1 November, Juventus and their supporters celebrate the club's birthday. This year's celebrations will have been extra sweet thanks to Saturday's derby win over Torino which lifted the Serie A champions into the top half of the table for the first time this season. England and Scotland's European hopefuls turn their attention back to the Champions League and Europa League this week. So are their respective opponents in form or not? Russian Premier League leaders CSKA Moscow go to Manchester United on Tuesday for a crucial Champions League tie on the back of a 2-0 win over FC Ufa. On the same night Manchester City are at Sevilla, who lost 2-1 at Villarreal in La Liga. At least Bayern Munich have been stopped in their tracks ahead of Arsenal's visit after their 10-match winning start in the Bundesliga was ended by a 0-0 draw at Eintracht Frankfurt. Chelsea manager Jose Mourinho is desperate for any kind of win but his side will face a Dynamo Kiev team still going strong in the Ukraine Premier League, where they are second on goal difference after a 2-0 win over Metalist Kharkiv. In the Europa League, Rubin Kazan enjoyed a 2-1 win over Anzhi Makahachkala ahead of the visit of Liverpool, while Ole Gunnar Solskjaer's Molde warmed up for their return visit to Celtic by beating Viking 4-1. In a clean sweep, Anderlecht, who face Tottenham at White Hart Lane on Thursday, beat Mouscron-Peruwelz 2-0.